BATON ROUGE - The weather will subside slightly Wednesday after a quick and severe weather event Tuesday. A strong storm knocked out power to thousands, blew over trees and created dicey lightning that hit trees and buildings. The St. George Fire Department said it responded to a dozen weather-related incidents, including a lightning strike at a strip mall near the mall that caused electrical damage and a house fire in University Club. Near LSU, trees fell and closed side streets. Lightning strikes were reported at several locations around the parish, including the Paula G. Manship YMCA off Siegen and Perkins. EMS said two people initially reported they were struck by lightning while moving outdoor umbrellas, but they turned down being taken to the hospital. A YMCA employee told News 2 the lightning actually struck a tree near the workers, throwing sparks and spooking the two. The severe thunderstorms also led to a flash flood warning just before 5 p.m. until 7:45 p.m. Downed trees were reported across Lee Drive in Baton Rouge and on Highland Road between Siegen and Bluebonnet, causing those roads to be closed. Authorities reported Hwy 621 between L Landry and Hwy 73 in Ascension Parish was also shut down due to large tree which fell and hit a car. According to DOTD the driver is fine and worker are on the way to cut the tree. "It just swept up so fast. It was howling," David Gary said of the storm he watched move across the sky above his house in East Baton Rouge, near the lakes. About 4,000 people remained in the dark as of this post. Wednesday will be better, the WBRZ weather team said. Showers and storms could move into the area after 2 p.m. but are not expected to be as severe. 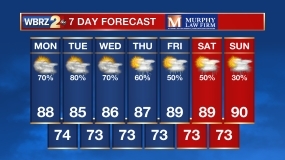 Click HERE to visit the weather page.